A drake Garganey was seen today on Heron's Green Pool; a Barn Owl was seen nearby, and a Green Sandpiper was in Heron's Green Bay. No sign of the Franklin's Gull today. One adult Little Gull remained this morning, the female Greater Scaup was still at the south end of Moreton Bank (from Stratford) and three Swallows were seen amongst the c.250 Sand Martins. Little else to report, other than the recovery of a Danish-ringed Black-headed Gull at Nunnery this morning. The Franklin's Gull decided to spend the day at Chew again; as before being mostly distant in the centre of the lake. There were also three Little Gulls (two first-winters and an adult), c.150 Sand Martins, two Swallows and one House Martin. The drake Lesser Scaup was still on tank 3 today. After being reported at Blagdon last night, the Franklin's Gull was seen distantly in the roost off Nunnery Point this evening, where the first-winter Little Gull was also seen. A Barn Owl was seen again over Heron's Green Pool, and a Swallow was seen over Herriott's Bridge. The Franklin's Gull was still present this morning, and for the first time, spent the whole day on the lake, at times showing quite well in front of Moreton hide. The first-winter Little Gull was also present. Other birds included the Great Northern Diver, a Barn Owl at the entrance to Moreton by the B3114, 500-plus Sand Martins, and a nice find this evening to end the long weekend - a drake Garganey on Heron's Green Pool. The drake Lesser Scaup was still there today. Just when it looked as though Chew was going to avoid having any rarities in what is turning out to be a quality weekend, a cursory check of the gull roost this evening produced the second-winter Franklin's Gull. A Little Gull was also present, and a scan of the 380 or so Sand Martins produced a single House Martin. The Franklin's Gull was still present today, before flying off towards Chew at 18:00. The drake Lesser Scaup was still on No.3 today. Please note that access to the Barrows is by Permit only - you can buy one from Chew at Woodford Lodge. Checks were being made by BW rangers today. 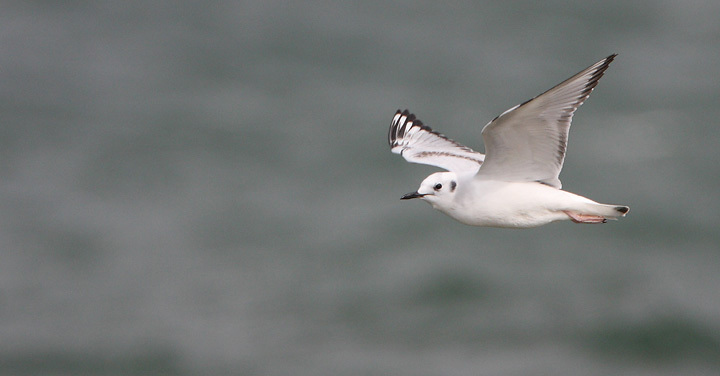 The first-winter Bonaparte's Gull was still showing well today, on the wind-battered SW edge. The partial summer-plumage Red-necked Grebe was near the Axbridge tower, as was that flock of five-and-a-half Greater Scaups. The Great Northern Diver and a Swallow were also seen today. Difficult to find many birds today in the continuing howling northerlies. However, there were plenty of Sand Martins at the north end of the lake, and an early House Martin was seen around the car-park at Nunnery Point. The first-winter Little Gull was also still present, three Green Sandpipers were on the main dam, and the (presumed) drake Greater Scaup x Tufted Duck was in Villice Bay. The Franklin's Gull was still present today. The drake Lesser Scaup was still on No.3 this morning. A splendid find today was a first-winter Bonaparte's Gull - showing really well along the SW edge all afternoon. Access from the Cheddar end car-park; walk clockwise. Also the Great Northern Diver still present, as was the Red-necked Grebe, a Black-necked Grebe (possibly from Chew?) and five Greater Scaup showing at close range by the Axbridge tower - the latter still have that nasty hybrid with them. The Franklin's Gull was still present today. A second-w/s Mediterranean Gull and a Redshank were a couple of other birds of note. Having successfully predicted the 'moving' of the drake Lesser Scaup from Blagdon, I was somewhat disappointed to find that once again it has spurned the delights of Chew in favour of an evidently more desirable water. Nevertheless, its appearance on Barrow No.3 this morning was a site first. The Black-necked Grebe and Little Gull were still around today, with c.350 Sand Martins over the lake. The Nordic Jackdaw was again seen in the sheep fields at the bottom of Stratford lane. The second-winter Franklin's Gull has been relocated on flooded playing fields at the Cadbury's factory. This is the second record for the site, following one there in 2000. There's also two Mediterranean Gulls there. A better day for both the weather and the birds - a Marsh Harrier was seen a couple of times in the Moreton/Stratford area this afternoon (unusual in March); the Black-necked Grebe was still off Nunnery Point, and the first-winter Little Gull is still in the centre of the lake. Some other news: three Green Sandpipers on the main dam, a male Wheatear on the Parkland, c.100 Sand Martins, Barn Owl at Moreton again, 'plenty' of Chiffchaffs, 35-plus Meadow Pipits and 25 Redwings. The drake Lesser Scaup was still present in Rugmoor Bay today. Blagdon opens for fishing on Thursday - might the disturbance boot it off to Chew? No sign of the Franklin's Gull this evening. The first-winter Little Gull was still over the lake, a Barn Owl was again seen at Herriott's Pool, and the 'Lesser Scaup-alike' hybrid was at Stratford again. The drake Lesser Scaup was still present today. A gloomy, rainy day; a late afternoon visit to Nunnery Point produced the first-winter Little Gull swimming about picking flies from the surface of the lake, and at least 500 Sand Martins - a high count for mid-March. A Wheatear was in the ringing station field this morning. An 'actual' drake Lesser Scaup was at Top End today, showing well from the hide. A Franklin's Gull was seen early this evening - note that there is no public access to the dock, but it had been present at Portishead seafront earlier in the afternoon. The Great Northern Diver, female Greater Scaup and Black-necked Grebe were still present today, and yesterdays Barn Owl was seen again this afternoon at Moreton and Villice. Other birds included a Little Egret in flight at Stratford, 15 Sand Martins, 126 Goldeneye and a Woodcock. A Barn Owl was seen in flight over the B3114 at Heron's Green this afternoon, and the Great Northern Diver was again on the Roman Shallows later in the day. The gull roost tonight consisted mainly of Herring Gulls and Lesser Black-backed Gulls from the local colonies; a couple of Mediterranean Gulls were found amongst the smaller gulls. A reminder that the fishing season opens tomorrow at Chew. A summer-plumage Black-necked Grebe was a good find this afternoon, between Nunnery Point and the entrance to Villice Bay. A Red-breasted Merganser and a female Greater Scaup were seen from Stratford hide. The recent high winds have blown part of the roof of Stratford hide off! A Barn Owl gave good views at Herriott's Bridge this afternoon as it hunted over the main reeds and flew across towards the ringing station. Elsewhere, the Great Northern Diver was off Sutton Wick this evening, an adult Mediterranean Gull was seen in the roost, and 15 or so Sand Martins were over the lake. A Curlew was heard calling from Nunnery Point this evening. The first-winter Little Gull was still present this afternoon, joined in the roost today by an adult. Two Mediterranean Gulls were also seen in the (now depleting) roost. Eleven Sand Martins were seen over the lake in the grotty weather. Six Mediterranean Gulls and 18 Sand Martins were seen from Nunnery Point this afternoon. A Brown Hare on the Parkland was an unusual sight this evening. Twelve Sand Martins today - another good number for so early in the month. Five Green Sandpipers today was another unusually high count. Other birds seen included two Water Pipits (Heron's Green Pool) and two Chiffchaffs (Nunnery). Ten Sand Martins late this afternoon were a sure sign that spring is on the way, but the rest of the birds were those which were left over from the winter - the Great Northern Diver, six Mediterranean Gulls in the roost (four adults, single first and second-winters), the first-winter Little Gull still, and on Heron's Green Pool, two Water Pipits, a Green Sandpiper, a Water Rail and a Snipe. The (presumed) drake Greater Scaup x Tufted Duck reappeared off Nunnery Point this evening, and a Barn Owl was seen in Heron's Green Bay. The (apparently accidental) draining of Heron's Green Pool continues to bring in new birds - a Grey Plover there today was a good find - barely annual at Chew, they're tricky enough even in the autumn. Three Green Sandpipers were also present. The gull roost this evening produced five adult Mediterranean Gulls and a Great Black-backed Gull. The Great Northern Diver (Roman Shallows) was also still present. Spot the Med Gulls. Move your mouse over the picture to reveal.